Before the massive availability of computers, development of virtual reality was focussed on the creation of sensory experiences that gave the user the illusion of 'being there'. For this the suspension of disbelief was of primary importance. Not entirely unexpected the origin of virtual reality lies not in science or engineering but in cinematography, in the work of filmmaker Morton Heilig. Heilig was convinced that it was possible to stimulate the senses in such a way as to accomplish a richer, more submersive and thus believable cinematographic experience. 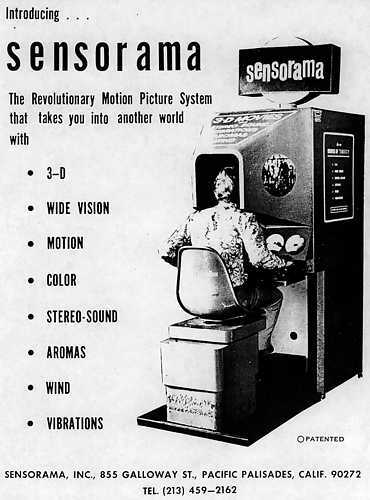 In 1960 this resulted in the Sensorama Simulator, a film machine, resembling the later arcade models, in which the user was subjected to surround 3d imagery, contextual smells, stereo sound and vibrations. In one of the films especially made for the Sensorama the user rides a motorcycle through Brooklyn, wind in your hair, a live feed of sounds and smells of the city while every dent in the road was felt through its vibrating chair. In the end the Sensorama formula failed to attract enough financers for further development, especially because in Hollywood other efficient and cheaper cinematographic tools were developed to support the intended suspension of disbelief. Still, anyone seeing present day developments in virtual and augmented reality can see that the spirit and vision of Morton Heilig never really disappeared. These films inspired Yuri Suzuki to build a breakfast machine!